A gossipy take on the glossy but star-crossed lives of two well-connected women who inspired writers and painters but were often lonely and unfulfilled. Like a Merchant-Ivory movie, the story told by British food-writer Dimbleby takes place in a luxurious country house (Kiddington Hall in Oxfordshire) whose guests included royalty (the Prince of Wales), politicians (Herbert Asquith), famous writers (Henry James), and artists (Edward Burne-Jones), all making and breaking romantic attachments. It makes for an entertaining if speculative read, as the author tries to understand her great-grandmother May and great-aunt Amy. In 1873, May, the daughter of a clergyman noted for her beauty and charm, married Henry Gaskell, a wealthy former soldier. She bore him three children (Amy was the eldest), but his reclusive habits, long silences, and morose personality soon irreparably strained the marriage. May began to spend more time away from him, both abroad and in London, where she became a popular member of influential social and cultural circles. In 1892, she met pre-Raphaelite painter Edward Burne-Jones and became the last romantic obsession of his life. It appears that the long-married painter’s relationship with May was intense but fundamentally platonic, despite the passionate effusions in his many letters to her. He died in 1898, shortly after Amy’s marriage to a soldier. Though May enjoyed close friendships with other distinguished men and went on to do valuable work during WWI, she never quite recovered from the loss of Burne-Jones. 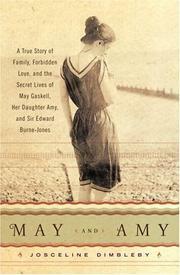 She was hit hard again in 1910 when Amy “died of a broken heart,” as May told her grandchildren. An enigmatic beauty who inspired three novelists and was loved by many men, Amy was never able to find love herself. Restless, she traveled constantly, perhaps developing a fatal opium habit in the Orient. For American readers, a peek at British life upstairs as it really was.